Launch your own Android TV App Instantly ! You are definitely missing out if you haven’t already discovered the whole new world of Android TVs – The fastest popularizing platform in the world. 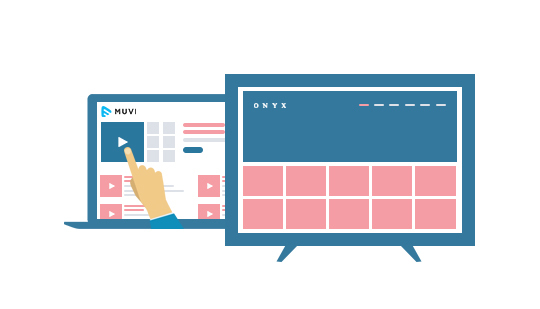 Whether you want to extend your reach by launching your App on the Android TV platform or you specifically want to design an App for the Android TVs, Muvi does it all for you. Android TV is the next big thing worldwide, with millions of people using it and the ease of access it provides for the Video Content Providers. Muvi Lets you create a completely customized, beautifully crafted Android TV app along with the monetization option of your choice. Launch your smart TV app on Android using Muvi. Our exclusive template for Android TV app is based on lean back model and accommodates the new design guidelines and latest features for a rich user experience. It is arguably the best TV app template from Muvi till date. Get the feel of your streaming app even before it is developed! As soon you become a Muvi customer, unlock your true ownership and get hands-on with your streaming app right from the beginning using Muvi Onyx. Onyx app (patent-pending), an innovative invention from Muvi, delivers a near deployment quality working preview of your native TV app instantly where you can stream video/audio and test the streaming quality as well! See, feel, and experience your streaming app through Muvi Onyx till the original app gets mustered up at developer’s desk to be one of the best in business. Launching your own Android TV app is extremely simple and a matter of just few clicks with Muvi. You just have to sign-up and let us know your customization needs, Muvi will take care of everything else, right from the design that talks all about your brand or the complete app management & updates; you just sit & relax, when it is Muvi taking care of your Android TV app. With your Muvi powered, Android TV app you have the power to target the entire Android TV powered ecosystem and reach across a wide range of devices using Android TV as their Core Operating System (OS). So it doesn’t matter if it is a Smart TV or Set Top Box (STB) or simply a Media Box, as long as it is powered by Android TV, your Android TV app is automatically compatible with it and you can target this device and it’s users in 1-click! Muvi does not provide you an app that will reflect someone else’s brand first and then yours. At Muvi, we have developed a completely white labelled, robust platform that works as your IT infrastructure and lets you create and launch an App quickly with your-only brand name featuring everywhere – the App Store, Website, Watermarking, so that you don’t compromise on your brand identity at all. Your Android TV app will have ample of features for you as well as your viewers to make the most of this app. The app will have easy navigation and a variety of options for your viewers to play with your channel such as login, search, bookmarking of of their favorite content and you will have complete access to monitor user behavior, manage transactions and send alerts & notifications. Android TV apps powered by Muvi are enriched with features so that you make the most of your video business. Muvi will be your end-to-end partner in launching an exclusive Android TV app right from the theme selection to customizing your app according to your preferences, till the launch and complete platform management. Not only this, Muvi also completely takes care of the bug fixes and feature updates to your App so that you only manage your business, leaving all IT related worries to Muvi. Yes, Muvi provides you an option to customize your Android TV apps as much as you want. You can change the design, look and feel of your Android TV app and can even integrate it with any third party platform. Muvi ensures that you’re satisfied with what you get and we deliver it, no matter what! When it is a video distribution platform, Muvi completely understands your needs to monetize your content and make the most out of your streaming business. Thus, Muvi brings you an option to choose from all the available VOD revenue models be it SVOD, AVOD, PPV/TVOD, EST or a hybrid of all. Muvi also consults and suggest you the best model suiting your business needs, and considering the audience type, so you just don’t miss out. Your Muvi powered Android TV app will also be able to play with multi-currency payments, multiple payment gateways, prepayments and do a lot more to maximize on your profits. You would definitely want to know how your Android TV App is performing and what your viewers are liking. Muvi provides and in-depth analysis and reports on the performance and behavior of your app so that you can customize your video business strategies accordingly. Make the most of your video streaming business by launching an Android TV app powered by Muvi that has all the goodies to give you much awaited success.